Sifaka lemurs are excellent at climbing through treetops – but just wait until you see them move across the ground! To make a home in tall, skinny trees, you need to be good at climbing… and jumping! This is the sifaka lemur. Crazy skill: graceful leaping! Sifaka lemurs live in the forests of Madagascar. To help them jump from tree to tree, they have specially adapted legs, which are much longer and more powerful than their arms. One strong push… and just look at them soar! Because their legs are so much longer than their arms, sifaka lemurs can’t walk on all fours like most other primates. So if they need to get somewhere on foot, they leap across the ground like ballet dancers! Maybe we should call them twinkle toes! So how does the sifaka lemur score on the crazy-o-meter? It uses its long, powerful legs to leap through the trees, and move gracefully across the ground! Sifaka lemurs have long back legs. This adaptation helps them to climb and jump through trees. The sifaka lemur's long back legs prevent it from walking on all fours like other primates. 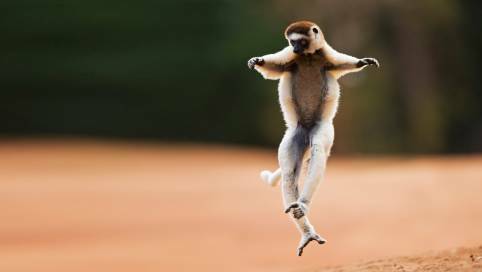 To move across the ground, sifaka lemurs leap on two legs. Where does the sifaka lemur live? How has the sifaka lemur adapted to living in tall skinny trees? How does the sifaka lemur move around? Complete your lesson with teaching resources on adaptation from Tigtag.